Developed by language-learning expert Catherine Bruzzone, the German for Children programme is a fun and effective way for 3 - 10 year old children to learn the German language and culture. 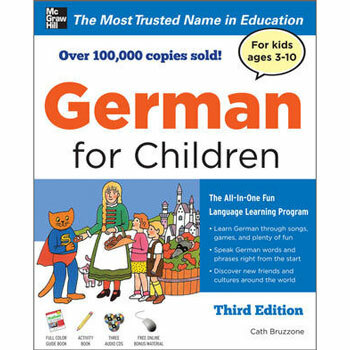 This introduction gets your son or daughter speaking German right from the very beginning and keeps him or her engaged with a wide range of activities and games that keep language-learning fun. German for Children is suitable for early language learning. It is aimed at complete beginners aged 3 - 10 and the included CDs help families with no previous knowledge of German to learn together.